The detective stood up, and he brought the prisoner, Do-joon (Won Bin, 원빈) to stand at the same time. “Just stand up, don’t worry,” he assured him, as he opened a drawer, and pulled out an apple. “I’m not going to hurt you.” He raised it to Do-joon’s mouth, and told him to bite down on it. “Do you know what sepak takraw is?” The prisoner, not exactly the sharpest tool in the box to begin with, give a quizzical “Huh?” He bit down on the apple, making sure it’s held down tightly between his teeth. It is easily the coolest scene in the movie. Is it because it is a popular sport in Malaysia and its neighbours? Maybe. But perhaps just by itself, it is still a very cool scene. Beyond that, there is still plenty to savour in this fantastic thriller by Bong Jung-ho. Followers of Korean films may well recognise his efforts from ‘The Host’ (one of the biggest hits in Korean film history), and also his sophomore effort, ‘Memories of Murder’. I credit ‘Memories of Murder’, along with ‘Oldboy’, for really kicking my interest in Korean films into high gear, and so I, along with almost every other person with a casual interest in Bong Jung-ho, has been waiting with baited breath for his fourth directorial effort. ‘Madeo’ tells the story of (Kim Hye-ja, 김혜자), a mother in a small town in Korea. She has a son, the aforementioned Do-joon, who suffers from autism. It’s not quite the ‘Rain Man’, but he does have problems socialising. As such, he is commonly regarded by the others as the village idiot. He does, however, have a pretty loyal friend in Jin-tae (Jin-goo, 진구), who spends a lot of time with him causing all sorts of mischief, some which results in them being captured by the police. However, the mother is always the one to the rescue, turning up time and again to bail out her son, purely out of the love she has for him. 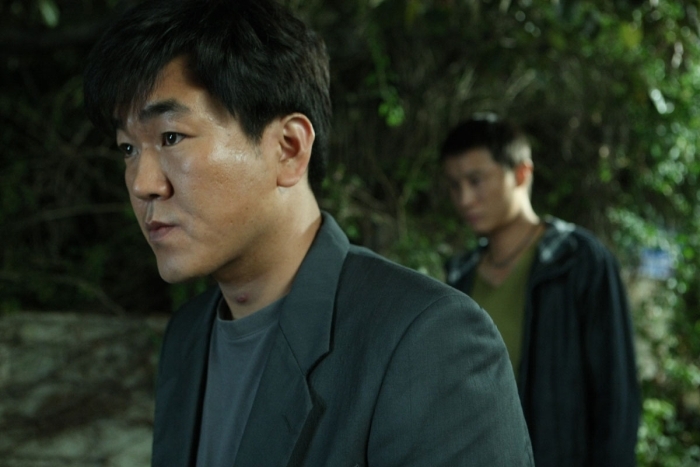 Things, however, become more difficult once Do-joon was implicated in a murder case; while everyone is convinced of his guilt (including Do-joon himself, even though he could not recall clearly, if at all, the night of the incident), his mother is driven on even harder, and goes out to find the truth. For once, a synopsis that is not particularly long. I do not make excuses for it, for that is a reflection of the film itself. In so many ways, the film is a simple one. Gone here are the extensive use of computer generated images by the director in his last film; instead, what I detected is a big reliance on two things here: a very strong script, and a wonderful performance by Kim Hye-ja. First things first, the script. There are two beautiful things about it: it’s simplicity and complexity. Simplicity, because the premise itself is simple and easy to follow. A mother, believing her son to be innocent, fights to find the truth. Not difficult, is it? But also complex, because the film is structured as a mystery. There are lots of details even in the smallest of things, and it is these that allowed the film to truly come to life. An acupuncture set. Golf balls. Handphones. Even water from a bottle can be a source of great tension. The tension could be cut with a metaphorical knife. In terms of logic, there’s little of the holes that you could poke your pinkie through. Versace’s winter collection ads were uninspiring. In the middle of all this is Do-joon’s mother. Her characterisation is rather similar to a previous Korean movie I had seen called ‘Marathon’. In that, a mother also fought hard for her disabled son’s future (primarily as a marathon runner). In ‘Madeo’, however, the mother is fighting not only for her son’s future, but also for herself. She had given everything to ensure that her son would be safe up until now, and her limits are about to be strained even further. One particularly poignant scene was when Do-joon was eventually picked up by the police for his apparent involvement, and she went out of her shop to go after the car. The camera, positioned inside the car, looking back at the rearview mirror, gives us both Do-joon’s point of view of his mother, receding further away into the distance, as well as highlighting his relationship with his mother, and vice versa: there is always a screen, a barrier, an obstacle in place. With such troubles she had endured up until then, and the trouble that further ensued, I felt that Kim Hye-ja was absolutely perfect for this role. Her face was lined with experience and sorrow, and some of her most heartfelt scenes was magnetic. In fact, the opening of the film, when she was dancing and swaying alone in the field, accompanied by the European jazz-tinged soundtrack, was…well, I couldn’t quite take my eyes away. The rest of the characters are merely the sideshow to her spotlight, and I would include Won-bin in this as well. His reactions to being called a retard was comical, and in fact his naivety can also be a source of much-needed comedy at times. A lot was made of his big return from military service to the silver screen, but even here, I believe a lot of his actions, while they were well-acted, was not meant to take centre stage. Rather, they served to highlight his mother’s characteristics even more. 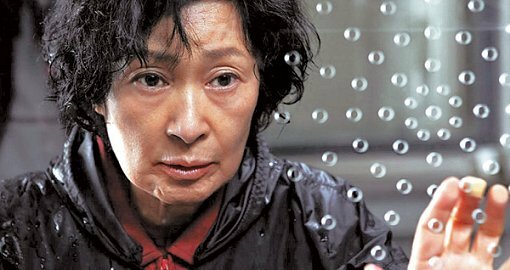 This is not to say that she is inherently good; what I have always admired about Bong Jung-ho is his ability as a director to create and enhance flawed characters, and, failing that, flawed characteristics within these characters themselves. They are all flawed characters here, and none more so than Do-joon’s mother herself. You will perhaps flint backwards and forwards between liking them and hating them. But you will feel something for them. You will care for them. The guy in the background? He’s credited as ‘sepak takraw detective’. Seriously. It is a powerful experience. Make no mistake about it, the sum is always greater than its parts. In ‘Madeo’s case, the parts are good, and is worth watching two or three times even, if only for the sake of dismantling the film and then putting it back together, trying to figure out how, just how, the film was made so. The director is good. The script is good. The score is also rather good. Some of the parts, however, shine brighter than others, and none shone brightest here than the star that is Kim Hye-ha. If nothing else, watch it for her performance alone. And the sepak takraw, of course. Can’t believe it turned up in a big-time Korean movie. At first, Fikri thought that ‘Madeo’ was the Konglish version of ‘Murder’. It turns out to be ‘Mother’, but the first allusion is also not that far off. I’m gonna be catching this. Memories or Murder was intense. The movies that suckered me into Korean movies were ‘Attack The Gas Station’, ‘The Quiet Family’ and ‘Christmas In August’. And ‘Il Mare’ for the cinematography.